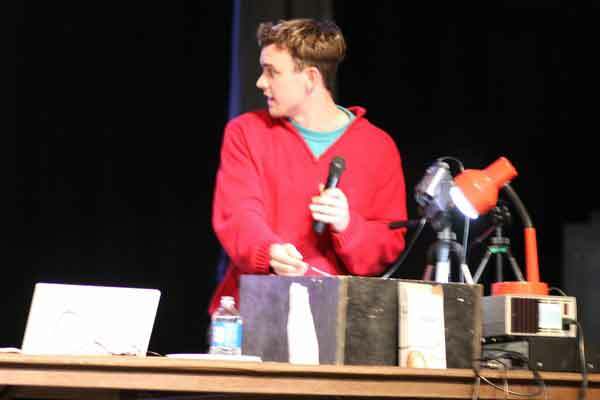 The Society of Physics Students at Wabash College invites the community to take part in the Fifth Annual SPS Demo Show on Wednesday, March 14 at 7:00 p.m. in Ball Theater of the Fine Arts Center. The demonstration show is entirely organized and run by the Society of Physics Students, and the group is proud to mark Albert Einstein’s birthday with a celebration of physics in his honor. “We will have some old favorites like the rocket sled demonstration and the smoke ring guns, some new twists to old favorites (a bass guitar driving our fire tube and a powered-up laser demonstration), and some completely new demonstrations, ferrofluid and other surprises,” said SPS advisor Dr. Martin Madsen. The event is free and open to the public, and promises to show off the laws of physics in an entertaining manner. Click here for photos from last year's show.